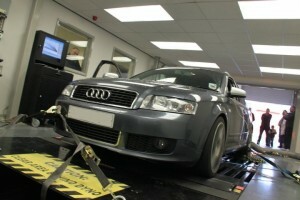 ECU remapping with Viezu – www.viezu.com Rolling Road Tuning and Dyno Day. This weekend we had another great dyno day with our good friend Mark – Chip and Spin Tuning. It was a very busy, with 14 cars run and tuned on the day. It was really good fun with the highlight of the day being the 300bhp Ford Anglia – what a beast! Viezu offer its dealers and customers full access to our technical and research centre for dyno testing and dyno days as well as training and tuning development – we take our tuning and ecu remapping very seriously. Viezu offer car tuning and ecu remapping for almost all cars, many of the cars on this dyno day were from the Vag family of vehicles, one of our specialist subjects is VW ecu remapping and Audi tuning and performance parts. The Audi and VW tuning is very responsive, both petrol and diesel tuning can be carried out, with custom tailored engine tuning and ecu remapping. Viezu offer ecu remapping and car tuning services worldwide, ecu tuning all makes and models of vehicle. Find your local Viezu car tuning dealer at www.viezu/dealer-map . For all Diesel Particulate Filter tuning requirements, DPF problem solving, see www.dpffix.com Dpf removal, dpf deletion and issue solving. Feel free to get in touch with us at info@viezu.com. Viezu – We never settle for second place!